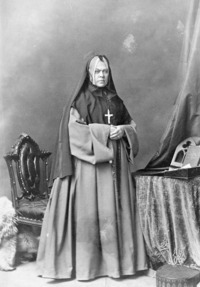 BRUYÈRE (Bruguier), ÉLISABETH, founder and first superior of the Sisters of Charity of Bytown (Ottawa); b. 19 March 1818 at L’Assomption, L.C..; d. 5 April 1876 at Ottawa, Ont. Elisabeth’s father, Charles Bruguier, was the eldest son of Jean-Baptiste Bruguier, who came originally from Pont-Saint-Esprit in Provence and arrived in Canada in 1756; Charles Bruguier’s second wife was Sophie Mercier. Elisabeth’s baptismal certificate gives the name Bruguier, but the spelling was later changed to Bruyère. From 1830, six years after her father’s death, Elisabeth received a religious, intellectual, and domestic training of the highest quality under the protection of a cousin, Abbé Charles-François Caron, the parish priest of Saint-Esprit (Montcalm County). In 1834 she taught at the local school; she continued teaching at Saint-Vincent-de-Paul (Laval) when her benefactor was transferred there in 1836. 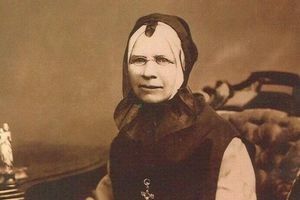 Elisabeth was easily moved by the sufferings of others, and in 1839 entered the order of the Sisters of Charity of the Hôpital Général of Montreal, commonly called the Grey Nuns. She professed in 1841 and was placed in charge of a ward of 40 orphan girls, whom she strove to train according to the principles she had received. In the autumn of 1844 the community was invited by Patrick Phelan*, coadjutor to the bishop of Kingston, to establish itself at Bytown (Ottawa), an important centre of the timber industry, where the Catholics had no schools, hospitals, or relief organization for the needy. In the face of so many needs the community agreed to cooperate, and entrusted responsibility for the undertaking to Mother Marguerite-Dorothée Beaubien*. She became ill, and Sister Elisabeth Bruyère, despite her youth, was asked to succeed her. On 12 Feb. 1845 Ignace Bourget*, bishop of Montreal, gave Sister Elisabeth Bruyère and her three companions a letter of authorization allowing them to set up one or several communities in Bishop Phelan’s diocese, provided that they conformed in every respect to the rule followed by the mother house, the Hôpital Général of Montreal. For his part Bishop Phelan welcomed them officially to his diocese, and by a canonical order issued on 11 April 1845 he instituted the community of the Sisters of Charity of Bytown. The community was to be entirely autonomous except for the act of fidelity to the rule of the mother house. 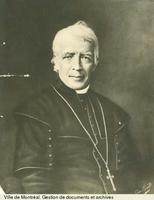 When the latter adopted a new rule in 1851, which prohibited the running of boarding-schools and fee-charging schools, Joseph-Bruno Guigues, who had been bishop of Bytown since 1848, was unable to agree to it; paid teaching had already been authorized at Bytown, and the poverty of the diocese did not make it possible to give financial support to another exclusively teaching community. In 1854 the Montreal house recognized the complete independence of the Ottawa community, which obtained its own rule in 1856. The founders of the community had reached Bytown by 20 Feb. 1845, ready to assist the parish priest, Adrien Telmon; within three months they had established their chief projects. On 3 March one of the first so-called “bilingual” schools in Upper Canada was inaugurated. On 10 May a small seven-bed hospital opened its doors. In June an organization to care for the poor and the sick was set up. A noviciate began to take shape in the summer with the admission of four aspirants, three of them from Bytown. The typhus epidemic of the years 1847 and 1848 was for the young institute its initiation to heroism. With none but themselves to tend more than 600 patients sent to them by Dr Edward Van Cortlandt, the sisters saved some 475. 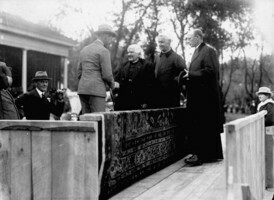 In addition they were entrusted with the care of about 15 infant orphans. The epidemic overcome, they returned to their labours. In 1850 a capacious stone house replaced the cramped dwelling of the early days. This building housed the nuns, the orphans, the aged, and a girls’ boarding-school which subsequently became the convent of Notre-Dame-du-Sacré-Cœur. A hospital was also equipped, and a school erected at Bishop Guigues’ expense. Apart from the founding of a boarding-school and a parish school at St Andrews West, near Cornwall, in 1848, the community did not go beyond the confines of Bytown until 1857, when it opened a school at Buffalo, New York. Under Mother Bruyère’s direction, the community also concerned itself with missions; in 1866 sisters were sent to the Timiskaming district (Canada West), to assist the Oblates of Mary Immaculate among the Algonkins and the Crees in the region that is now northern Quebec and Ontario. 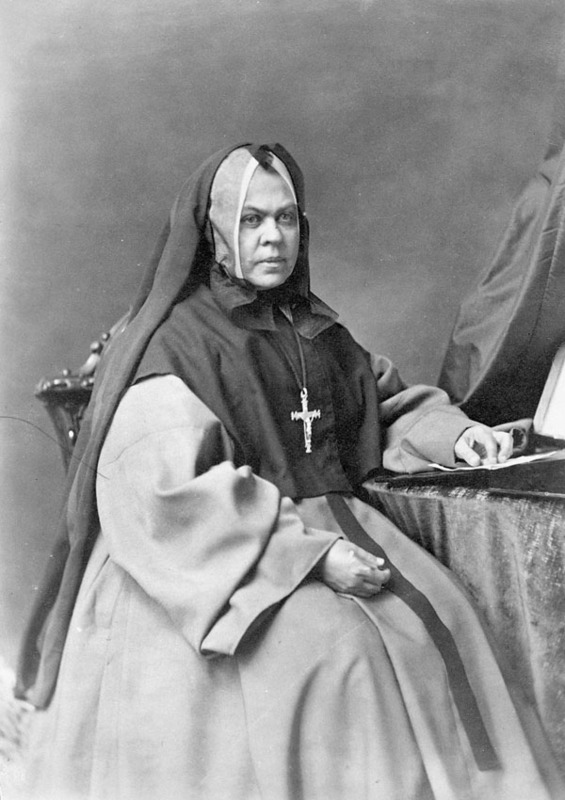 Mother Élisabeth Bruyère directed the community until her death, on 5 April 1876. During her long administration the community had opened some 25 houses in Ontario, Quebec, and New York State; all were under the direct control of the mother house at Ottawa. The majority were intended for teaching, and some concerned themselves with orphans, Indians, the aged, and the sick. It was an impressive achievement on the part of Mother Élisabeth Bruyère, who from the very beginning sought to make of her trainees workers who were deeply religious, zealous, and competent. Archives des Sœurs Grises de la Croix d’Ottawa, Annales de l’Institut, I (1845–1875), II (1875–1886); Correspondance Bruyère, communauté, affaires, famille; Correspondance relative à la fondation de l’Institut, dossiers Bourget, Phelan, Telmon, McMullen; Louis Richard, “Notes généalogiques de la famille Bruguier-Bruyère, en France et au Canada”; Registre de l’admission et de la décharge des malades de l’Hôpital Général d’Ottawa, 1845–1866, pp.12–99; Statistiques générales de l’Institut. Sœur Paul-Émile [Louise Guay], Mère Élisabeth Bruyère et son œuvre (Ottawa, 1945); “Mère Élisabeth Bruyère, fille de l’Église et femme d’œuvres,” SCHÉC Rapport, 1962, 51–58. Stanislas Drapeau, “Simple coup d’œil sur la communauté des Sœurs de la Charité d’Ottawa,” Album des familles (Ottawa, 1880), 398–401. 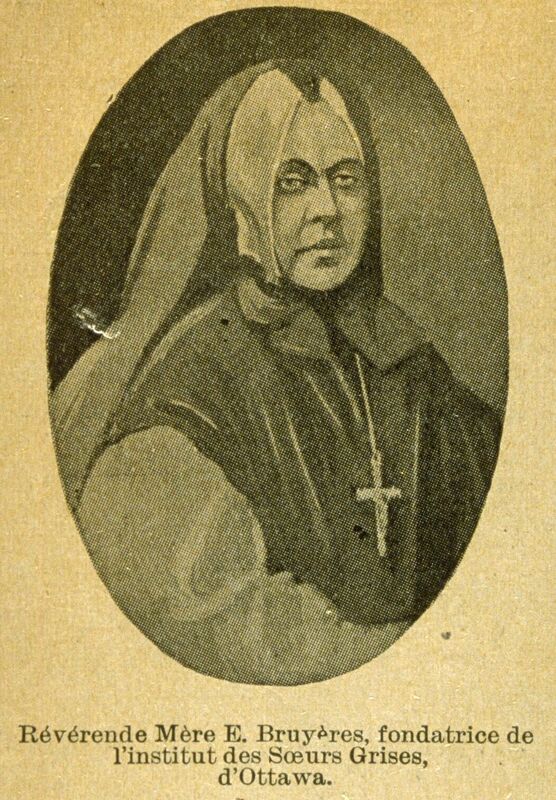 Soeur Paul-Émile (Louise Guay), “BRUYÈRE, ÉLISABETH,” in Dictionary of Canadian Biography, vol. 10, University of Toronto/Université Laval, 2003–, accessed April 25, 2019, http://www.biographi.ca/en/bio/bruyere_elisabeth_10E.html.